Scotland's women expect Bosnia to provide a stern test in Thursday's World Cup qualifier. 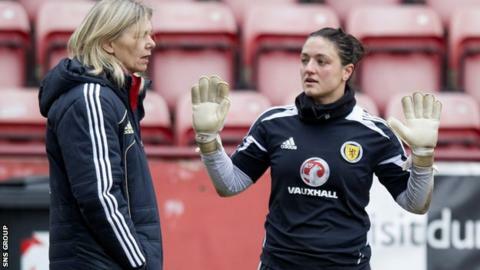 Bosnia were thrashed 7-0 at Fir Park in September but goalkeeper Gemma Fay told BBC Scotland: "I think they learned a lot from their defeat. "They've not lost a lot of goals since then. They've drawn 0-0 with Northern Ireland and Sweden needed a penalty to win 1-0. "Bosnia will be a compact team, sitting deep and hitting on the counter." Scotland top Group 4, with Saturday's 2-0 success at home to Poland their fifth win from five games, while Sweden also have a 100% record. "With a team like Sweden in the group, you just can't afford to slip up anywhere," added Celtic keeper Fay, who will win her 172nd cap in Zenica. "So we need to move the ball quickly, use smart combination plays and be clinical in front of goal. "Our confidence is high and we're still on track to qualifying for the World Cup. "We're just focusing on the moment and doing the best we can in each game before moving forward." Hibernian defender Siobhan Hunter, capped twice, has been called up to the Scotland squad, with Glasgow City's Emma Black dropping out through illness. Defender Ifeoma Dieke remains sidelined with a calf injury and Scotland coach Anna Signeul concedes her absence is a blow. "We've tried to do everything to get her playing but unfortunately, not. So, Megan Sneddon will drop down to play central defender alongside Jenny Beattie today," she said. On the threat posed by Bosnia, Signeul said: "Against Sweden, they had 11 players in the box....they will try to defend and prevent us from scoring. It's definitely going to be a tough game."